Esme showing a plastic ice bucket at Casa Ahued (Photo by Esme). Today, on her way back from teaching English, Esme went to Casa Ahued, a shop located near the center of Xalapa. I had asked her to look for a large transparent plastic pot to repot one of my orchids into. Casa Ahued sells a large variety of cheap plastic wares and hence Esme and I often refer to it as "the plastic shop." 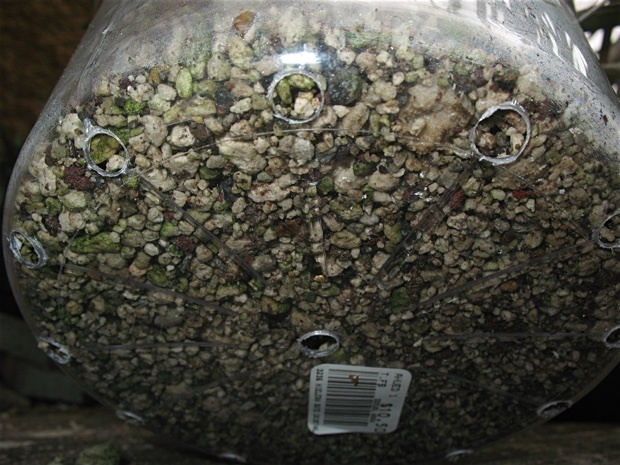 The original transparent pot of the orchid was literally falling to pieces and needed replacement sooner than later, especially as the orchid, a Dendrobium species, was about to flower. 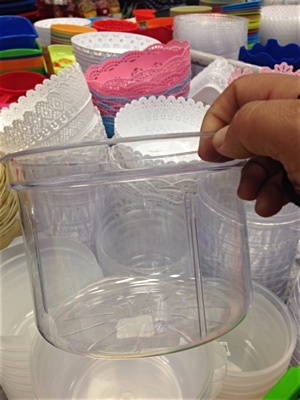 At Casa Ahued, Esme sent me photos of transparent plastic pots. I liked the plastic ice bucket the most and asked her to buy one so I could test if it worked as an orchid pot. The underside of the plastic ice bucket with holes drilled in it. I had already potted the orchid when I took this photo. In the afternoon I used a 550W Black & Decker drill with a metal drill bit to make holes in the underside of the plastic pot for drainage. I had to drill slow as not to melt the plastic. The ice bucket has a radial pattern of 12 lines which I used as a drilling guide making the hole pattern look neat. I made one additional hole in the center for a total of 13. The plastic ice bucket with a Dendrobium orchid species. 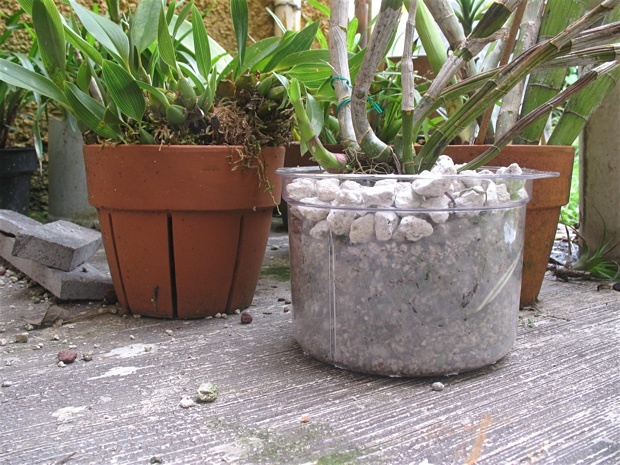 Transplanting the orchid was very easy and soon it was outside with some other orchid species. In the above photo you can also see how I have cut out slots in a terracotta pot. I used a angle grinder to do the cutting. But as this requires a security gear like a face mask and gloves and the pots have to be soaked beforehand it's quite some work. The reason for the slots is that the roots of non-terrestrial orchids have chloroplasts that are capable of photosynthesis, so exposing them to light helps the orchid. Of course, another advantage of the plastic ice bucket pot is that this exposes much more of the roots to light. 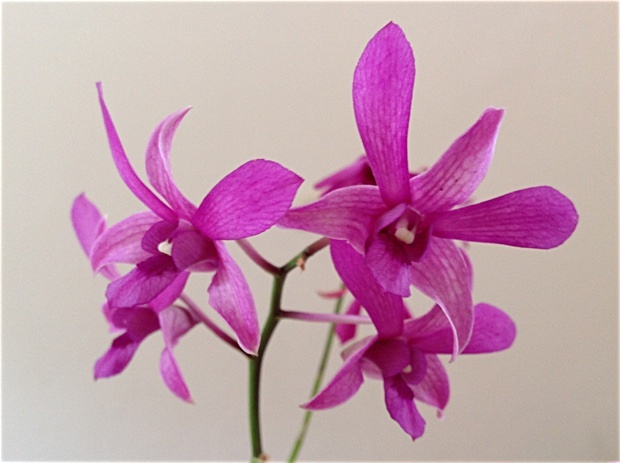 Dendrobium orchid species flowering nearly 4 years ago. I look forward to this Dendrobium orchid flowering as the last time has been nearly four years ago, back in August 2013. There is also a new growth coming, which hopefully will not take 4 year to flower.